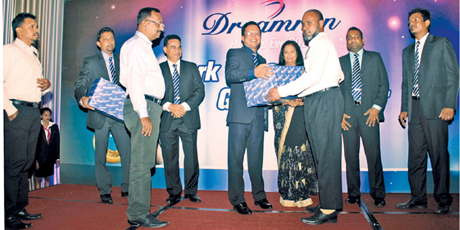 The Dreamron Group of Companies recently felicitated its distributors islandwide in recognition of their contribution to the growth of the company and achieved a turnover of Rs. 1.2 billion last year. A full-day workshop was held at its factory in Horana followed by a fellowship at a reception hall at Borelasgamuwa in the evening. Managing Director, Kindai Kagaku of Dubai, Amin Kamyab was also present. Among the highlights of the day were the renewal of partnership agreements with the Dreamron distributors in Sri Lanka and the renewal of the business agreement with Iran following the withdrawal of the international trade sanctions. Iran was one of the largest importers of dyes and shampoos of the Dreamron range. Director, Dreamron Group, Deepal Nelson said that Dreamron hopes to be a global brand by 2020 and have at least five of its products in the global market and also develop 10,000 beauty salons in Sri Lanka to international standards as a CSR effort of the company. The company will also contribute to the cosmetic industry in Sri Lanka by helping local beauticians to upgrade themselves to Diploma and NVQ standards at the Dreamron Art and Beauty Colleges in Maharagama, Negombo, Kurunegala, Kandy, Galle, Matara and Horana. He said the company hopes to set up a fashion and beauty care university by 2020 giving local and foreign students an opportunity to obtain a degree in fashion and beauty care.